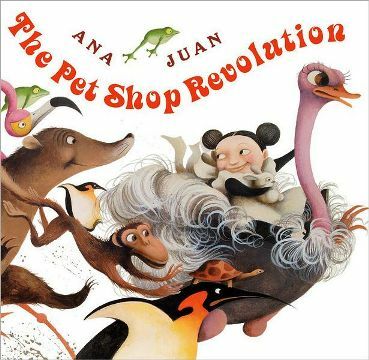 There is apparently no end to the twists and turns a picture book storyline can take, and The Pet Shop Revolution, a new picture book for ages 4 to 8 by author/illustrator Ana Juan, is a prime example of this fact. In The Pet Shop Revolution, a young girl named Mina snuggles with her fluffy pet rabbit and gazes with compassion at the miserable animals in the local pet shop. Their eyes are always sad and their faces are long, but no one in town is brave enough to do anything about it. After all, mean and scary Mr. Walnut, the pet store owner, doesn’t look as if he’s open to a discussion about his animals’ happiness. When Mina’s beloved rabbit goes missing, everything changes. With the help of Bobo, the boy who brings ice for Mr. Walnut’s pet shop, Mina finds her rabbit and sets all the animals free. When she does, the town’s mood lifts instantly. The animals are ecstatic, the townspeople are happy, and all is right with the world again. Until Mr. Walnut discovers his animals are gone, that is. Mr. Walnut demands they be returned to him, but that’s not about to happen. Why would any animal return to a tiny cage when it can live happy and free? So, desperate Mr. Walnut does something no one expects, to bring his customers back to his store. Of course, you’ll have to read the book to find out what that is. The Pet Shop Revolution is cute, but it’s definitely a “different” sort of picture book. The illustrations are quite dark, depicting the somber mood of miserable pets that want to be free. The illustrations have what I call an “old English” look and feel to them, reminiscent of the whimsical illustrations from the early Alice in Wonderland books. I rather like that, but I’m not so sure young children will embrace the exaggerated style. Unfortunately, the illustrations are not the only problem. I also found the plot a bit tricky, in that there is an insinuation that the sinister Mr. Walnut is responsible for the disappearance of Mina’s rabbit. While Mina does recover her beloved pet, the disappearance is never explained, and when you add this to Mr. Walnut’s seeming indifference to the animals’ suffering in the beginning of the book, it’s a given that young children will find him completely unlikeable. Thank goodness the animals escape, and since Mr. Walnut is forced to change his behavior once his pet shop is empty, he does at least become a bit more bearable. Because of the dark beginning of this book, I cannot easily recommend it as a lap time favorite. I think it may actually frighten young children. I do, however, feel it may be a great Halloween-ish read for slightly older children. It’s also great for pet lovers who want to teach children that all living things deserve to be free. 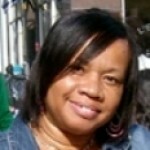 It might also be used to open a discussion about personalities, and the reasons behind actions and attitudes. I give this one 3.5 stars. For a pet shop experience with a different twist, be sure to read The Pet Shop Revolution.